March Madness is here. We felt like being very 2019 about it, and what could be more 2019 than flavored sparkling water? 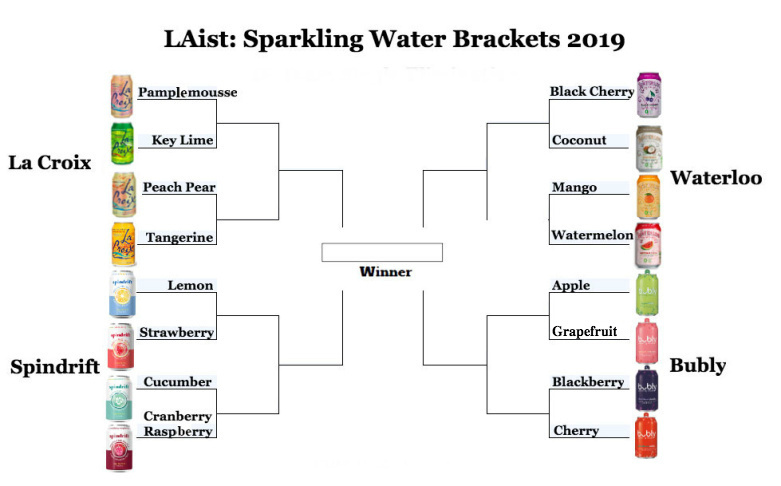 So we decided to rank the best sparkling water flavors and we're doing it in the most scientifically accurate method known to humanity... a bracketed showdown. You get to decide which flavor triumphs in this proverbial octagon of taste. We started by asking you, our loyal LAist fam, to tell us what your favorite flavors are. We also did a little research on the top brands and their most popular flavors. Where the grocery, food science and marketing industries intersect, people are being paid to study these things. You know what they've learned? Citrus flavors come out on top for pretty much every brand. You know what we learned from our Twitter callout? Aside from the fact that one of our key editors hates the stuff, we discovered that people are really in their feelings about sparkling water. This combo of crowdsourcing and pseudo-science, led us to our final picks. We eliminated store brands. (Sorry, Simply Balanced, your ginger peach flavor is 🔥and a personal favorite of LAist's food editor but that's why it's not here.) We also eliminated brands that we don't often see in SoCal stores (sorry, Ugly Drinks) and brands that don't produce many flavors of sparkling water (sorry, Topo Chico and smartwater sparkling). We eliminated Perrier because those prissy little cans are too expensive. We eliminated water you carbonate and flavor at home because there's no accounting for taste (if you want to create Beef 'n Cheese savory sparkling water, you do you). That left us with four prominent, widely available sparkling water brands — La Croix, Waterloo (not the battle or the ABBA song), Bubly and Spindrift. For each of these brands, we used market research and responses from our audience to choose what seemed like the top four flavors. That got us to our Sweet 16 sparkling water flavors. Then, we made a poll. Now, it's your turn. Vote early, vote often. You know the drill. We'll release the results around the time of the NCAA finals. Poll created by Dana Amihere.